February 20, 2017 SRM, industry standard and leader in power measurement, has announced a strategic partnership with LOOK Cycle, the top player in clipless pedals and carbon bicycles and components. SRM and LOOK will cooperate in devising, developing and marketing innovative products and services, both in composite and electronics. LOOK Cycle, which devises and manufactures its products and frames in its own workshops, will contribute its extraordinary know-how on composite to further enhance SRM product offering; SRM, inventor of the power meter system for cycling, will contribute its extraordinary experience in electronics systems and data treatment to expand LOOK future product range. The first collaborative project is a sophisticated carbon crank arm for the SRM Origin PowerMeter. The Origin, named for having all components designed by SRM - the original PowerMeter, was introduced at Eurobike last fall. It is a modular-concept PowerMeter offering limitless compatibility with exchangeable spindles designed to accommodate road, mountain, and track frames. With LOOK’s contribution, the PowerMeter will feature the highest calibre carbon crank arms with LOOK Trilobe Technology which allows one crank arm to function in three lengths; 170mm, 172.5mm, 175mm. With crank arms developed at the highest stiffness to weight ratio, the SRM Origin PowerMeter will be ridden by Team Bahrain-Merida and AG2R La Mondiale this season. “The training of Bahrain-Merida athletes is one of the most important areas in which we at the team invest. SRM is the benchmark of power meters, and we are proud to provide our athletes and performance staff such a valuable training tool.” Brent Copeland, General Manager, Bahrain-Merida Pro Cycling Team. “2017 is a revolutionary year for AG2R La Mondiale in terms of equipment. In addition to our new fleet of Factor Bikes, we are thrilled to partner with SRM and bring the gold standard in power back to the team. The SRM Origin PowerMeter offers a new level of benefits to a professional team with the exceptionally light and adjustable LOOK crank arm coupled with LOOK pedals.” Vincent Lavenu, General Manager, Pro Cycling Team AG2R La Mondiale. “We are excited about the opportunity to see LOOK, the best brand in clipless pedals and carbon making teaming up with SRM, the reference in electronics and power meter and to be able to devise exceptional, innovative and more intelligent products that will provide extraordinary emotions to our community of fans” says Federico Musi, CEO of LOOK Cycle. “It is extremely stimulating for SRM, the brand that revolutionized cycling by changing the way athletes train and race with the first PowerMeter, to partner with LOOK, an iconic brand in cycling, that shares with us the same passion for innovation, precision and craftsmanship” says Uli Schoberer CEO of SRM. The combination of SRM’s expertise in power measurement and LOOK’s extensive experience in composite has resulted in the most advanced tool available on the market. 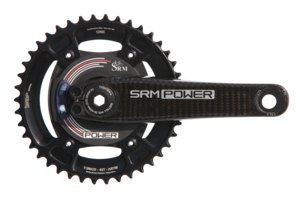 The SRM Origin PowerMeter is available to pre-order from SRM.